Engineering consultants WSP are leading on a number of crucial flood risk management schemes across Leeds to help alleviate flooding across the region. Based in Leeds, the WSP flood and drainage team is currently working on six separate schemes that circle the city with millions of pounds earmarked to implement the city’s flood alleviation programme. As part of the four-year programme, in Garforth, WSP has undertaken a strategic study looking at the issue of surface water. The team will be producing feasibility and assessment studies culminating with design recommendations for the town. To date, they have identified several flood risk areas identified for potential improvement. Paul Lambert, principal engineer in WSP’s flood & drainage team, said: “We have been looking at a catchment-wide approach that includes surface water and flood risk involving a number of areas of Leeds. East of the city at Halton Moor, WSP has been working on environment enhancements along the Wyke Beck corridor and improvements to Arthur’s Rein culvert, a meandering channel that has been cleared and desilted to open it up into a water feature; returning life to the watercourse. Around 200m have been cleared in total, bringing it back into use and providing a community space, as well as allowing land to be unlocked for potential development by alleviating flood risk on previously unusable sites. Close by in Killingbeck – part of the Wyke Beck Valley Project – WSP is engaged on various elements including a flood storage reservoir to alleviate flood risk further downstream and into Killingbeck Meadows. Due to complete summer 2019, the reservoir allows for flood water storage and includes a series of environmental enhancements including ponds in a more natural eco-setting for the area. Funding was allocated from the West Yorkshire Combined Authority and Leeds City Council. Closer to the city centre, WSP is involved in the Wortley Beck which flooded two years ago. WSP are working on a feasibility study to slow down the flows during peak rainfall. The beck has three large catchments and the feasibility study will be examining potential solutions within these catchments. Possible solutions include changing land use, using woody dams and naturalised engineering techniques. WSP has been working closely with research teams from the University of Leeds on this project too. Completing the raft of work, Paul and his team are key partners on one of Leeds’ flagship projects at Otley that was granted funding from Central Government following the devastating floods almost three years ago. 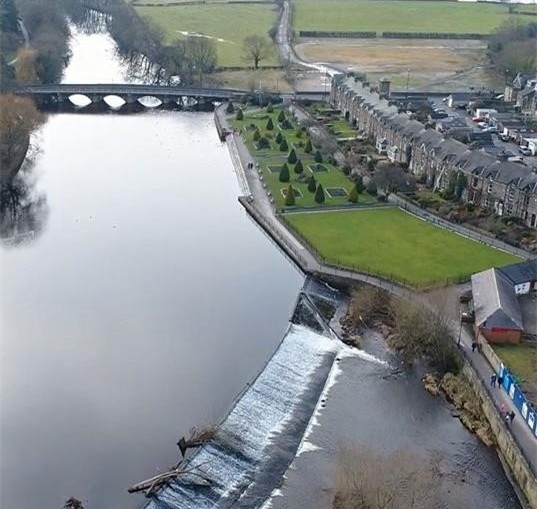 The Government announced an emergency £2m fund and WSP is currently collaborating on the proposed Otley Flood Alleviation Scheme to deliver improvements. WSP has been working on the project, from concept right and it is hoped to shortly submit a business case for funding to undertake the final design and then construction. A public consultation on the various options was held this summer with planning on the final scheme due to be submitted early 2019.